The funeral for Harris County Sheriff Deputy Darren Goforth was held Sept. 4 in Houston. After Goforth was fatally shot at a gas station on Aug. 29, some spoke about a "war on cops." But while 2014 did see more officer deaths than 2013, one expert says that's not a sign of a statistically significant spike. While the number of police officers killed on duty nearly doubled from 2013 to 2014, the increase is deceptive, says Seth Stoughton: 2013 had unusually few deaths. 2014 was comparable to other recent years and to the 10-year average. Note: The FBI uses the term "felonious deaths" for the deaths of officers from injuries incurred in the line of duty during criminal incidents. "It is time for the silent majority in this country to support law enforcement," said Devon Anderson, the Harris County DA. "There are a few bad apples in every profession. That does not mean there should be open warfare declared on law enforcement." The notion of growing "warfare" against police stems in part from a statistical jump in the number of law officers murdered — "feloniously killed," in the jargon of the FBI's numbers. In 2014, the year of the Ferguson protests and increased media attention on police misconduct, 51 officers were killed nationwide. That was a jump from the 27 killed in 2013 and many took it as a sign of greater danger for police. Seth Stoughton, a former police officer and an assistant law professor at the University of South Carolina, calls that interpretation "nonsense." "It's misleading to compare one year to another year," he says. Stoughton has been collecting and analyzing these data going back decades. He says 2014 looked bad in comparison with 2013 mainly because 2013 was so good. "2013 was the safest year for police officers, ever," he says. "The safest year in recorded history." In fact, in the larger scheme of things, 2014 looks pretty normal. 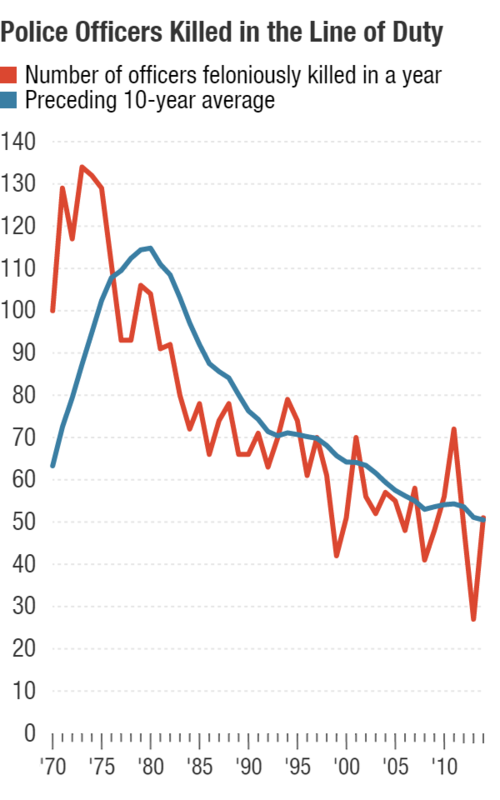 The number of murders of police was about the same as 2012, and actually a lot lower than 2011. The long-term trend is even more encouraging: On average, only about half as many police are murdered every year now, as compared with the 1970s. Stoughton says some of that improvement is probably due to better training, better gear and radically improved trauma care for cops who are shot. But he says the numbers suggest officers are also facing fewer attacks: The number of assaults on police has also fallen, though not as sharply. Stoughton says he's not saying police work isn't dangerous — it certainly is. And he also admits we may be seeing a few more ambush killings — cops attacked just because they're cops. But it's hard to isolate motives in these numbers, and any uptick is probably in the single digits. "When we're talking about 780,000 state and local police officers who are interacting with people on 67 million occasions every year, the increase from five to eight, or five to 10 — statistically, it doesn't look significant," he says. But statistical analysis is cold comfort to police officers after a colleague has been ambushed. Some officers have been understandably shaken. In a video that made the rounds soon after the Texas deputy was killed, a Miami officer named Lydia Marquez records herself in her car. "When I kiss my children in the morning before I go to work, I don't know if I'm going to be coming back at the end of the day," she says. "Especially nowadays." Marquez ends her video defiantly, with the phrase that's become a rallying cry for many cops since Ferguson: "All lives matter. Everyone's life matters." "All lives matter" may sound noble, but activists hear it as code for something else. "The way that people use the phrase is in direct opposition to 'Black Lives Matter,' " says Daunasia Yancey, a prominent member of the Black Lives Matter movement in Boston. "I think that this 'war on cops' rhetoric is just another way to protect police from accountability," she says. "What they're facing is not violence; it's accountability." Soon after Goforth's murder, Texas Lt. Gov. Dan Patrick condemned what he called the "negative attitude" toward police. Accused of using the killing to shut down legitimate criticism of police, Patrick took aim at the media. On the public radio show Texas Standard, the host tried to ask him about all the recent videos showing police misconduct. "Your type of interview has to stop," Patrick said. "Yes, there are people in every profession who cross the line and should be fired," he continued. "Quit focusing on that small percentage of those in law enforcement who have made a mistake." Edward Conlon, a retired New York police detective who writes about police work, says his former colleagues feel unfairly judged by the mistakes of a few. He says they haven't seen evidence of a "war on cops," but they do feel embattled when it comes to public opinion. "The notion that there is an epidemic of violence by police is just a really hard thing to swallow," he says. And he sees a parallel here. He thinks both sides are guilty of drawing dramatic conclusions from isolated cases. "It's not even half right that cops are at war with black America, and it's not even half right that there's a war on cops, in any big or broad sense," Conlon says. But there does seem to be at least one kind of war going on: a war of perceptions, driven by competing feelings of grievance. Recent murders of law enforcement officers have raised the specter of a new war on cops. Some police and politicians say that criticism of police since the Ferguson protests has inspired more people to target cops. NPR's Martin Kaste reports that if you look at the statistics, they tell a different story. 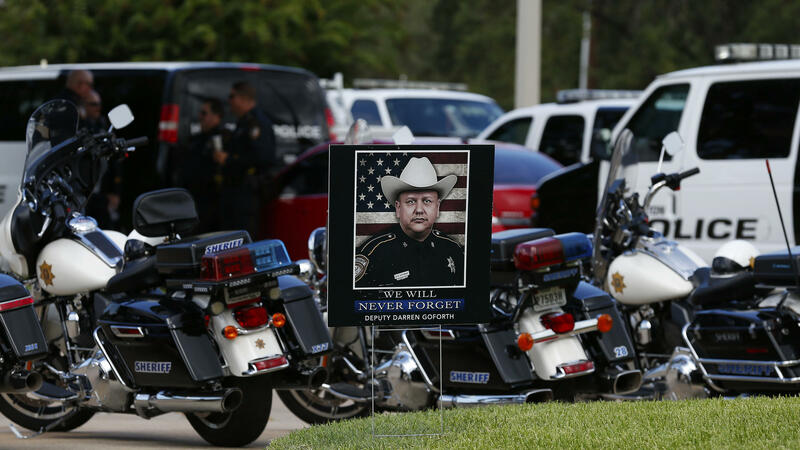 MARTIN KASTE, BYLINE: When a sheriff's deputy named Darren Goforth was gunned down at a gas station in suburban Houston late last month, the reaction was swift and angry. DEVON ANDERSON: It is time for the silent majority in this country to support law enforcement. KASTE: That was the local TV news leading off with the district attorney, Devon Anderson. While she didn't ascribe motive to the suspect, she warned of the dangers of an overly negative public attitude toward the police. ANDERSON: There are a few bad apples in every profession. That does not mean that there should be open warfare declared on law enforcement. KASTE: People who see a war on the police point to what happened in 2014. That was the year of the Ferguson protests and new media focus on police misconduct. And that year, the number of police murdered on the job jumped. Nationally, 51 were killed - almost double the number of the year before. Proof of an ominous new trend? Seth Stoughton says no. SETH STOUGHTON: Well, it's nonsense. It's misleading to compare one year to another year. KASTE: Stoughton is a former cop who now teaches law at the University of South Carolina, and he's been collecting and analyzing these data going back decades. He says 2014 looked bad in comparison with 2013 mainly because 2013 was so good. STOUGHTON: Two-thousand-and-thirteen was the safest year for police officers, ever, the safest year in recorded history. KASTE: When you compare 2014 with other years, it looks pretty normal. The number of cop killings was about the same as 2012 and was actually a lot lower than in 2011. Stoughton says he's not saying that police work isn't dangerous - it certainly is. And he also admits that we may be seeing a few more ambush killings - cops that are attacked just for being cops. But it's hard to isolate motives in these numbers, and he says if there is an uptick in ambushes it's probably in the single digits. STOUGHTON: When we're talking about 780,000 state and local police officers who are interacting with people on 67 million occasions every year, the increase from five to eight or five to 10, statistically, it doesn't look significant. KASTE: But statistical analysis is cold comfort to police officers when a colleague's been ambushed. Some officers have been understandably shaken. This video made the rounds soon after the Texas deputy was killed. It's an officer in Miami, named Lydia Marquez, recording herself in her car. LYDIA MARQUEZ: When I kiss my children in the morning before I go to work, I don't know if I'm going to be coming back at the end of the day. I don't know, especially nowadays. KASTE: And Marquez ends her video defiantly with a phrase that's become a rallying cry for many cops since Ferguson. MARQUEZ: All lives matter, everyone's life matters. KASTE: All lives matter - it may so noble, but to activists, it sounds like code for something else. DAUNASIA YANCEY: The way that people use the phrase is in direct opposition to Black Lives Matter. KASTE: Daunasia Yancey is a prominent member of Black Lives Matter in Boston. YANCEY: I think that this war on cops rhetoric is just another way to protect police from accountability. What they're facing is not violence, it's accountability. KASTE: Soon after the murder of Deputy Goforth, Texas Lieutenant Governor Dan Patrick condemned what he called the negative attitude toward police. When he was accused of using the tragedy to shut down legitimate criticism, Patrick took aim at the media. Here he is on the public radio show Texas Standard, as the host tried to ask him about all the recent videos that show police misconduct. UNIDENTIFIED HOST: There's a lot of skepticism out there. How do you convince those people? DAN PATRICK: You know, your type of interview has to stop. You know, when I was asked to do an interview on NPR, I thought to myself, you know, do I really want to do this? They're not in the police officers' corner. UNIDENTIFIED HOST: How do you mean, sir? PATRICK: Well, you have to understand this. Yes, there are people in every profession who cross the line and should be fired. Quit focusing on that small percentage of those in law enforcement who have made a mistake. KASTE: Most cops don't go this far, but lately, they share an uneasy feeling that they're all being judged by the mistakes of a few. Writer Edward Conlon is retired NYPD, and he says when it comes to public opinion, his former colleagues do feel embattled. EDWARD CONLON: You know, the notion that there is an epidemic of violence by police is just a really hard thing to swallow. KASTE: And he sees a parallel here. He thinks both sides are guilty of drawing dramatic conclusions from isolated cases. CONLON: It's not even half right that cops are at war with black America, and it's not even half right that there's a war on cops, in any big or broad sense. KASTE: But there does seem to be at least one kind of war going on. It's a war of perceptions, and it's driven by competing feelings of grievance. Martin Kaste, NPR News. Transcript provided by NPR, Copyright NPR.